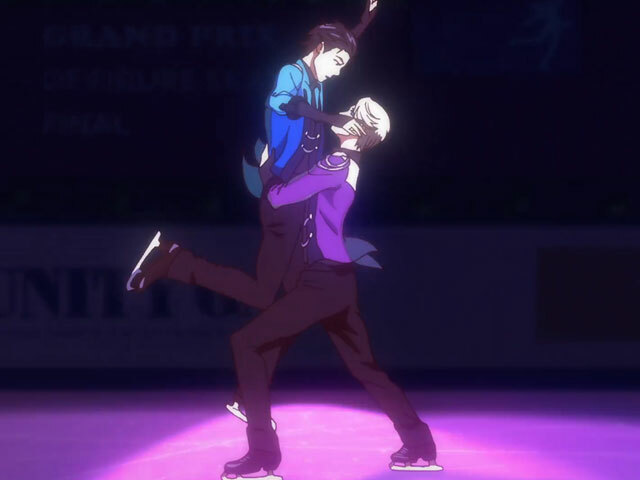 Yuri Katsuki and Victor Nikiforov are from the anime series Yuri!!! on Ice. Yuri grew up completely idolizing Victor and his skating, and although Yuri did achieve some success on his own in the competitive figure skating world, he was never able to get on the same level as Victor. After Victor saw a video of Yuri's passionate performance where he was able to perfectly imitate Victor's gold medal winning routine, Victor immediately announced his retirement so he could become Yuri's coach. With Victor on his side providing unwavering support and encouragement, Yuri was able to find the self confidence inside himself that allowed him to push his skating further than he ever thought possible. When I first started watching Yuri!!! on Ice, I was not aware that there was going to be a any kind of romantic relationship between the two main characters, although from the very first episode I could see that there was going to be something special between them. Watching Victor and Yuri's bond and feelings for one another grow felt so natural and real, and it was so satisfying to see their relationship progress throughout the series. I enjoyed watching Yuri, who had always admired Victor from afar, become close with the real man and get to share all the different sides of himself that he had either kept hidden or didn't even know were there. And it was equally special to see how Victor was able to find inspiration, purpose, and happiness through being Yuri's coach, friend, and more. During Yuri's performances, it was moving to watch his thoughts drift to Victor and see how it strengthened his resolve to succeed and allowed him to constantly strive for more. During those same routines, it was also so sweet to watch how absolutely proud Victor was of Yuri's accomplishments. Because Victor saw something special in Yuri and believed in him, Yuri was able to trust in himself, and could then show the world what he could do. Just like Yuri's observation on how Victor always surprised him, I found that this show always surprised me. I never expected to see their emotional reunion at the airport, or learn that Victor's feelings for Yuri started back when a drunken Yuri begged him to be his coach, see them exchange rings, see Victor cry when he thought Yuri didn't need him anymore, or see them skate a beautiful pairs routine for Yuri's exhibition performance. Their scenes together were all so precious (and filled with lots of hugs and blushing), and it was very touching to see how far they made it in the final episode both together and individually. Their future plans for skating revolved around how they could remain together and not only achieve their own wants and goals, but also continue to provide what their partner needed to keep moving forward. Victor: "Yuri. It's your turn." Yuri: "U-um, I'm... I'm going to become a super tasty pork cutlet bowl, so please watch me!" [hugs Victor] "Promise!" Victor: "Of course. I love pork cutlet bowls." Victor: "What do you want me to be to you? A father figure?" Victor: "A brother, then? A friend? Then, your boyfriend, I guess. I can try my best." Yuri: "No, no, no, no, no! I want you to stay who you are, Victor! I've always looked up to you. I ignored you because I didn't want you to see my shortcomings. I'll make it up to you with my skating!" Victor: "Okay, I won't let you off easy, then. That's my way of showing my love." Victor: [hugs Yuri] "Yuri... I've been thinking about what I can do as your coach from now on." Yuri: "Me too. Please be my coach until I retire!" Victor: [kisses Yuri's hand] "It's almost like a marriage proposal." [they hug] "I wish you'd never retire." Yuri: "Let's win gold together at the Grand Prix Final." Yuri: [hugs Victor] "Victor! Please stay with me in competitive figure skating for one more year! This time, I'll win gold for sure!" Victor: "Great! But keep going!" Victor: "Even I'm worried about making a full comeback if I'm also staying on as your coach." [puts Yuri's medal around Yuri's neck] "In exchange, I'll need you to become a five-time world champion, at least." In my Sims 4 game, Victor and Yuri are enjoying married life with their dog, Makkachin. They spend their days skating on the rink in their backyard, playing with Makkachin, and taking tons of photos.